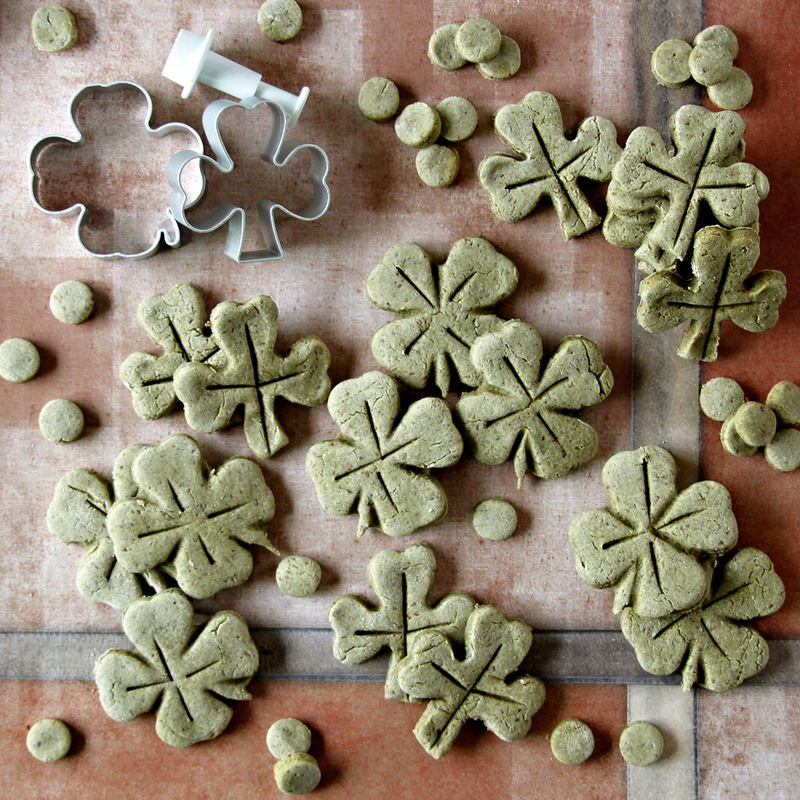 Whether you partial to the traditional trefoil shamrock or lucky four leaf clover (I made both! ), this naturally green treat dough is perfect for baking up a St. Patrick's Day treat. Lucky dogs indeed! Preheat over to 180C. In a large mixing bowl, stir together the stock, egg, butter, flax, kale, and herbs to combine. Incrementally add flour to the mixture until the dough has a nice workable consistency. The amount of flour required may vary depending on your individual mixture and any optional ingredients, so working the flour in incrementally is important. Missed the mark? No worries! You can add a little bit of water, a drizzle of olive oil, or additional flour to adjust consistency if needed. Rest dough (optional). Roll and cut to shape. Bake for approximately 10-12 minutes. Cooking time will vary with size and thickness, so keep an eye on the oven. Cool before storage and serving. I liked my plain little shamrocks and clovers, but decided they would be even prettier with a little more leafy style, so I used a knife to create indents as veins in the center of the leaves and the fat/dull side to create some added definition between the individual leaves of the clover. Easy peasy and extra cute! This icing-free decorating trick works nicely for human cookies, too. These treats would be also be scrummy with a tempting add-in like finely grated cheese or ground bacon. Add it after mixing, before resting. 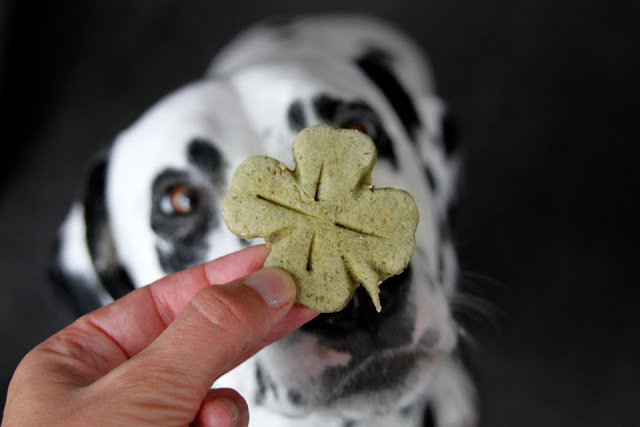 My dogs love their greens, but if you dog doesn't, you can achieve a similar look using green food colouring (or boost the colour of a naturally lighter green dough). My go-to stock is simple unseasoned broth saved from preparing homemade food. It can be VERY hard to source ready-made unsalted and unseasoned stock. Resting dough is optional for most of our treats, but when working with gluten-free flours and low-fat doggy doughs I find even a brief rest ~30 minutes can help to ensure consistent hydration (absorbing liquid into dry ingredients) and improve general handling. I work with most doughs at room temperature since, unlike human cookies, there are no butters or other fats to chill for consistency. For a crunchier treat, you can let baked treats sit a while in the cooling oven before removing to get a little crispier or pop the baked treats into a a dehydrator. 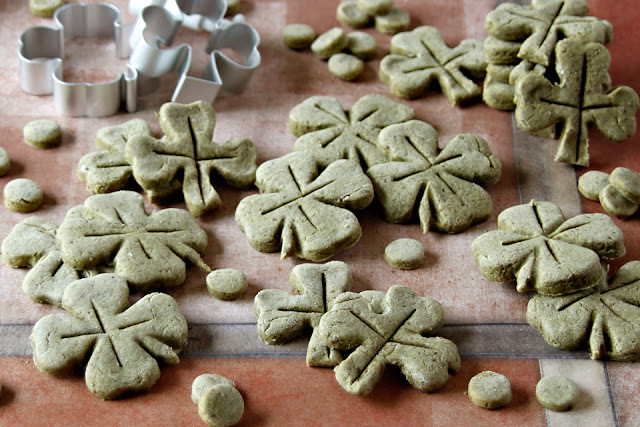 Homemade doggy treats don't use preservatives like commercial treats so they have a much shorter shelf life. The dryer the treat (such ad dehydrating) the longer they will last, but I like to use fresh or freeze for longer storage. Freezing is a great way to have a variety of treats on hand for mixing things up as well. Yummo! :) Hehehe. Our cheeky rascals will put on their best behaviour to get their treats. Per the tips, adding some cheese or bacon is a great way to make these extra tempting if you'd like to up the drool factor. Enjoy!